A revised version of an established vehicle is to line-up alongside a new concept vehicle when Mazda unveils its wares to the industry at the North American International Auto Show. 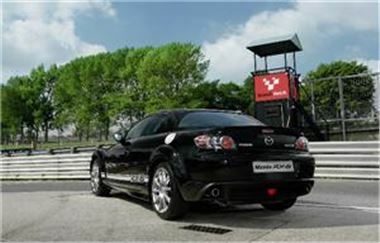 On Sunday January 13th 2008, a four-door, four-seat version of 2003's RX-8 will go on display with a host of improvements on the original model. "Sporting a freshened design, improved handling, stronger acceleration, enhanced quality and extra features, the heavily revised new version of the Mazda RX-8 continues to be a sports car like no other," it commented. One day later Mazda will show off its new Furai concept, which it claims to be environmentally sound due to its use of synthetic fuel. Motorists may also be drawn to the vehicle as its design has been influenced by a model from the American Le Mans motorsport series. Ford Motor Company owns a 33.9 per cent share in Mazda.